Ah, so you were the one that snagged those two from Eoin ! Thanks for the info, and Congrats, my man ! sword weighs - 2 lbs. 7 1/4 oz. , the blade & tang, 1 lb. 2 1/4 oz. 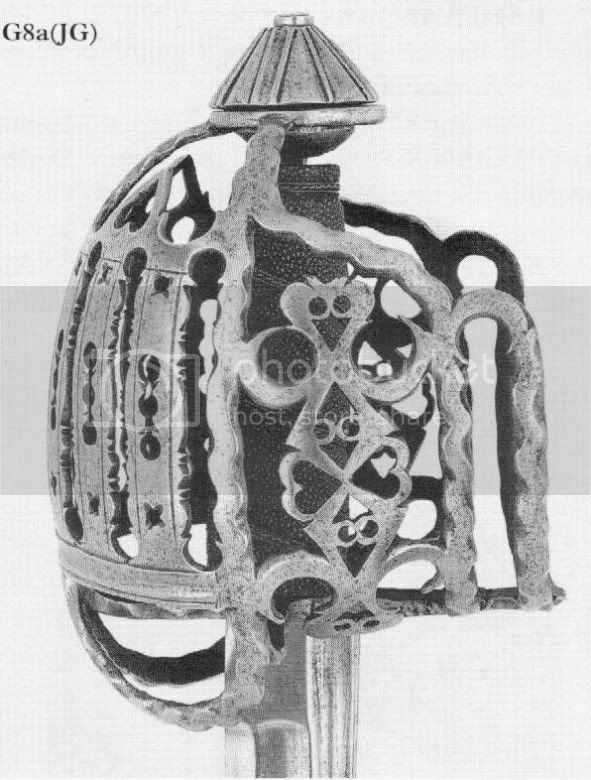 ; the hilt, handle, and pommel, 1 lb. 4 oz. sword weighs - 2 lbs. weight of sword is - 2 lbs. 3/4 oz. Ribbon hilt (far right) : sword weighs - 2 lbs. 8 oz. 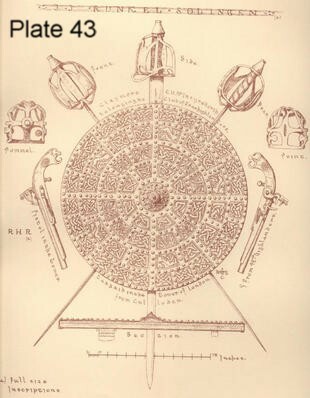 (ee) The weights were taken by a spring balance, with the exception of the specimen Plate 43 -- this was taken to pieces and each part carefully weighed; the one on Plate 45 was also carefully weighed. Mac/Jeff, Thanks for posting pictures of your wonderful b-h's. I wouldn't be able to sleep at night knowing I had them in the house! 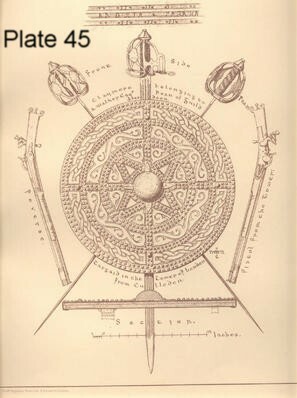 - The second illustration (Plate 44) shows a claymore in the possession of F. Mortimer, Esq., the hilt is a beautiful specimen of workmanship; the blade is 31" inches from hilt to point, the sword weighs 2 lbs. (ee); the maker's name is entirely obliterated; it was bought at the sale of the collection belonging to Mr. Drummond. Wow, this is a truly enlightening thread. Thanks to everyone who posted info on the weights of specific historical pieces. I don't own any basket-hilts--either originals or replicas--yet. But, I have handled quite a few originals, an a couple of replicas. ALL the originals I handled were light and well-balanced--I would guess that at least two of them were around 2lbs flat. 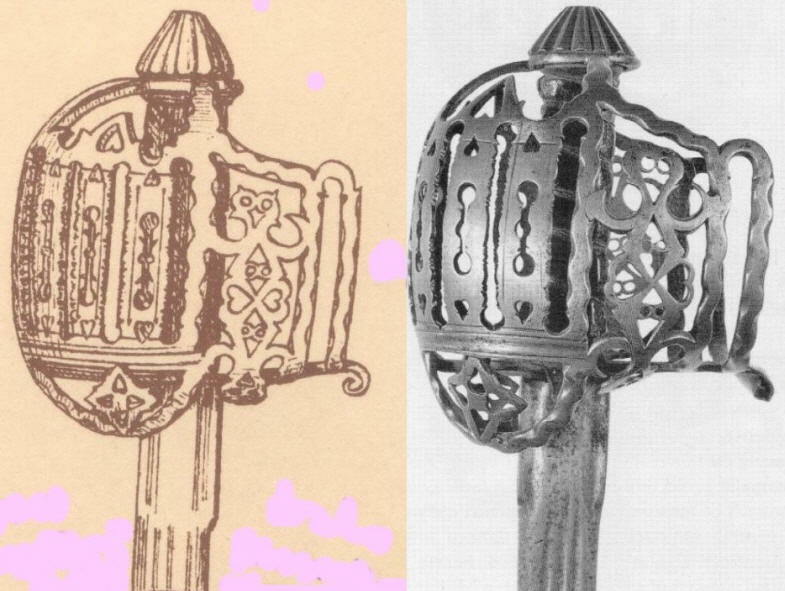 The replicas I have handled have been disappointing--an old Windlass "Irish Hilt" from Museum Reps, and Cold Steel's basket-hilted broadsword--both were friggin' clubs. As this information is relevant to this thread I've left it here. As Mac's Scotland trip is an independent matter I've separated it into another thread in the Off Topic forum so as not to derail this one. I've recently returned from a most amazing trip to Scotland & Ireland, where I joined Vince & Grace Evans on one of their incredible research & study missions ! I could go on, and on, for days about the breath-taking pieces I got to see, handle, photograph, and marvel at (which I will try to recount as we go along here at mA), but I'll just throw out a few more baskethilt weights for now as that is the subject at hand ! Baskethilt broadsword by Thomas Gemmill (Kings Armourer in Glasgow, c. 1718-1737) - 3 lbs. 2 oz. 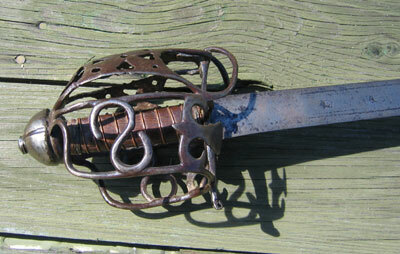 Baskethilt backsword by James Grant ( Stirling, admitted Freeman, Burgess/Hammerman, 1759) - 2 lbs. 7-1/4 oz. Baskethilt broadsword signed IN over G (possibly John Napier of Glasgow, ?, admitted Burgess 1654) - 3 lbs. 2 oz. Ribbon hilt broadsword - 2 lbs. 1oz. 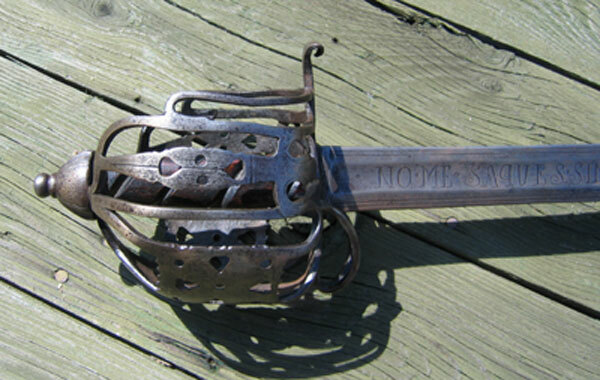 Baskethilt broadsword, c. 1720, by John Simpson 2 (Glasgow, admitted Freeman in 1711) - 3 lbs. 3/4 oz. Blade inscribed ‘IOHANNIS HOPPE ME FECIT SOLINGEN’ . * Pictured Here on the Glasgow/Kelvingrove Museum website. Baskethilt broadsword (ivory grip) - 2 lbs. 10-3/4 oz. Silver encrusted baskethilt broadsword (Twysden style) - 2 lbs. 9-3/4 oz. Silver encusted baskethilt broadsword (blade signed CLEMENS WILLEMS) - 2 lbs. 6-1/2 oz. Ribbon hilt broadsword - 3 lbs. 4 oz. I'm straying off topic here, but how much did historic claymores (the two-handed type, not the basket hilted type) weigh? I don't have the documentation available, but, IIRC, they weighed in the 4 to 5 or 5.5 lbs area, with some a bit heavier, a few a bit lighter. We weighed one two-hand claymore in the Glasgow reserve and it came in at 4 lbs. 15 oz., and another at the Burrell that was 4lbs. 9 oz. (missing its 2 quatrefoil terminal ends). Also, a clamshell two-hander that weighed in at 4 lbs. 4-3/4 oz., and a big 'ol Lowland type that tipped the scales at 6 lbs. 8-1/2 oz. There is a detailed look at this claymore, by Ian Kirkwood, linked from The Cateran Society's site ! It's 3 seperate pages in PDF format. The Claidheamh-mor, "great sword", or two-handed sword, was common at one time, but when it was introduced into the Highlands is unknown. 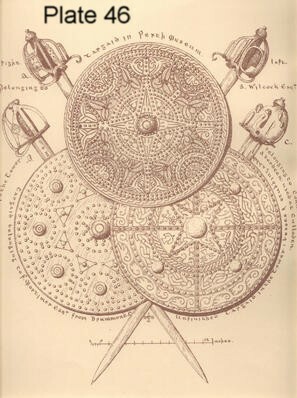 The one shown on plate 41(believed to have been used by Robert Bruce) is known to have belonged to the founder of the family of the McLeans of Coll. The handle is a fine specimen of carved work, the blade is of very good temper, and the sword is a very fine specimen of the armourer's art. 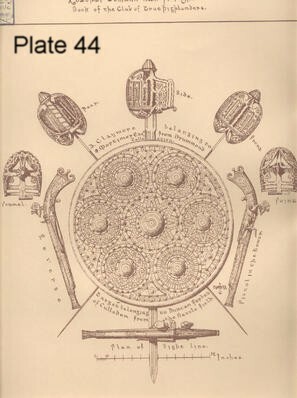 The scabbard is not of the same age (plate 41, fig. A). The sword weighs 4 lbs. 8 oz., and the scabbard 1 lb. 1/4 oz. Another sword, apparently by the same maker (also in the possession of Col. McLean of Coll), has not the same amount of finish bestowed upon it; the quatre-foils of the guard are left rough from the anvil, and the handle is plain; the scabbard is, however, older than the one previously described; both of the scabbards are of leather. Figs. BB show the sword used by Lundin of that ilk at Bannockburn; the blade is about 49" inches long, and the weight is about 6lbs. 8oz. Fig. 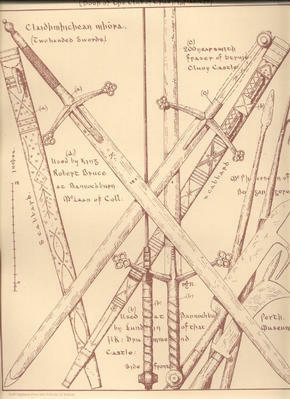 C shows a two-handed sword at Cluny Castle, which formerly belonged to Fraser of Struie; there is a very good specimen at Ardvorlich, and one in the possession of Sir Noel Paton. -- Leabhar Comunn Nam Fior Ghael , Vol. II, "The Book of the Club of True Highlanders", by C.N. McIntyre North , 1881. While proper balence makes these swords (two handers) all the more efficient & effective I just don't agree with the statement that "anything over 3.25 pounds is a club". Perhaps I am misunderstanding what you meant ? Can you elaborate further ! I';v done a bit with a basket hilt, and know once the adrenaline rush is gone, its hard to finess a restricted grip weapon. With straight grip swords, your secnd hand can add to control, so the weight is not as critical a factor. For finess I'd agree a lighter sword would be the weapon of choice, but for sheer power in the cut I'll take a stout 3+ pounder anyday ! It probably depends alot on a swordsman's indivdual strength, too, as to how effective a heavier piece fairs !